Indian Day, September, 1920, was the brainchild of the Indian Fellowship League and its sponsor, the Chicago Historical Society. Its purpose was to renew American Indian traditions and rituals and reacquaint America with Indian culture. Deer Grove was deemed an appropriate place for the encampment and it was a tremendous success. 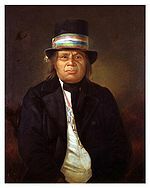 Siouan Chief Buffalo-Bear and Menominee Chief Oshkosh were among 200 Indians to take part in the celebration. 60,000 people viewed the spectacle over four days and the traffic jams on the skinny roads were horrendous. 200 Palatine Boy Scouts kept crowds a respectable distance from the guests of honor and Pathe Weekly caught it all on a newsreel. This entry was posted in Native Americans and tagged chicago historical society, deer grove, Native Americans. Bookmark the permalink.